The Carilli lab is focused on investigating human impacts on coastal environments. We specialize in reconstructing change through time to assess how increasing human activity has affected the environment, and from there organisms that live in the ocean. We primarily work in coral reef systems. You can read the blog posts for simplified descriptions of what we do here, here, and here and click links below to read journal articles we’ve written. *Reconstructing runoff using coral records from St. John, USVI from watersheds with differing land development and erosion control histories. 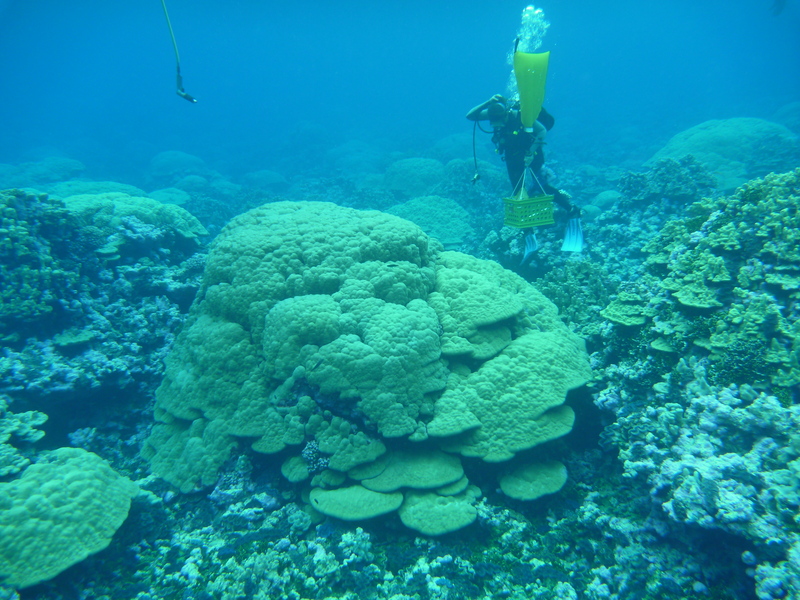 *Assessing fishing and other impacts on corals in the Line Islands, central Pacific. *Investigating coral resilience to bleaching (heat stress) events. *Studying how microplastics may act as vectors for pollutants. *Determining how iron addition interacts with heat stress to affect corals in the iron-limited central Pacific. *Calibrating runoff proxies in coral skeletons. Descending with coral coring gear at Kingman Reef. Great care is always taken not to damage living coral outside of the cored area – a tough job when a reef has such high coral cover! *Reconstructing runoff, coral growth rates and the occurrence of coral bleaching on the Mesoamerican Reef, as well as their interactions. We found evidence that local stress like runoff exacerbates the effect of heat stress and makes corals more likely to bleach and slower to recover from bleaching impacts. *Finding that past heat stress increases coral resilience to bleaching in the Gilbert Islands. *Discovering, using a novel application of a foraminifera indicator, that even moderate fishing on coral reefs can alter nutrient cycling in just decades. 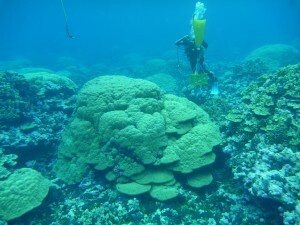 *Using coral records to assess climate change. We recently found evidence that the Walker Circulation has recently weakened. *Suggesting that coral symbiont clades may affect coral skeletal chemistry – a possible proxy to test for past symbiont shuffling after historical heat stress.